The votes are in! 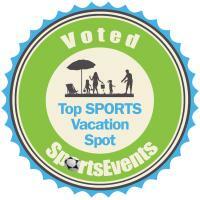 SportsEvents magazine&apos;s readers and Facebook fans have selected their top 7 picks for “Top Sports Vacation Spots.” SportsEvents Editors compiled a Facebook ballot with a list of 30 family-friendly sports destinations. From those 30 “Sports Vacation Spots,” including breezy mountain retreats, popular lake and river destinations, and oceanfront resort towns, fans were asked to vote for their top picks. Panama City Beach was among those cities honored with the accolade. Frank Brown Park - the premiere facility for Panama City Beach sports - encompasses over 200 acres and offers something for everyone. The park includes 9 full-size baseball/softball diamonds designed for tournament level play, T-ball field, 6 lighted soccer fields, a lighted basketball court, volleyball courts, 4 lighted tennis courts, walking/biking trails, a 1.25 mile jogging track, and a state-of-the-art playground. Frank Brown Park hosts regional and national events for youth and adults, including USFA Fastpitch Softball, Grand Slam Baseball and the World Softball League. Frank Brown Park recently underwent a $4 million renovation (the first renovation in its 37 years). Updates to the park include new backstops, rust-proof fencing, new dugouts, shaded spectator areas, improved layout to help with crowd flow, a new concession building and new restrooms. With these great updates to the park, a new sports park on the way, and beautiful beaches right around the corner - its no wonder Panama City Beach was named a Top Sports Vacation Spot.